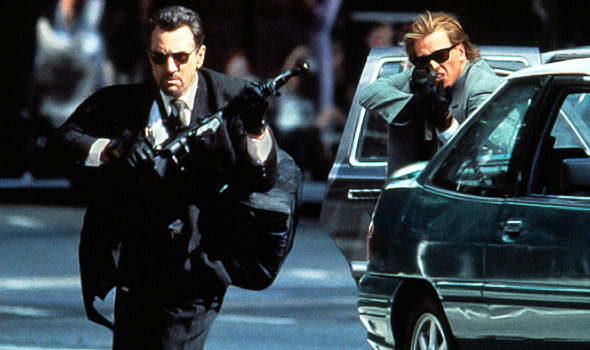 The absence of fast paced rock music added more depth to the shootout scene in Heat 1995. The sound engineers did a fantastic job with the Foley and hard effects. Those 12 minutes were realistically represented. Let us not forget about the other great scene in this movie where they knocked over an armored car with a semi truck. In that scene, one of the armored car guards had blood running out of his ears and the scene would cut back and forth to his perspective of being nearly deaf from the gunfire that erupted next to his ears. Beautifully done! Every perspective from the view of the camera brings us, the audience, that much closer to the forefront of the action. The handheld techniques used in some of the shots while the characters were running added more realism and seemed less staged as opposed to the cameras being locked down on tripods and booms. I remember when I first saw this movie in the theatres when it came out, I was taken back by the big sound in the theatre. The breaking of glass, the echoes of the gunfire of off the buildings all married with the gasps of the crowds and the sounds of screeching tires all added realism to the scene and as a result drew the audience into the circumstances playing out on the screen. I also felt emotionally attached to the characters. Those shots were reminiscent of what we always see on the news in LA. 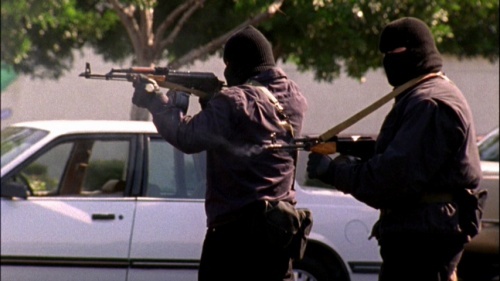 Today, the first thing I think of when I see that scene is the infamous 1997 North Hollywood shootout with the two armed bandits Larry Phillips, Jr. and Emil Matasareanu. These gunmen had more firepower than the local police and as a result the local police were out armed and virtually helpless against their counter attack. A .45 vs. an AK47 is not a fair fight! HEAT was released in 1995, so perhaps they sought inspiration from that film for their future crime spree? A American tragedy that had the unfortunate outcome of many people being killed and critically injured.